He came each evening, balding head, glasses and a football supporter's rattle. From 7.00 p.m. to 2.00 a.m. he had his appointed seat high up in section 55 of the Empire Pool. He had come to cheer on Painter and Smith in the Australian Sultanas Grand Prix, to see Verschuren and Lykke do their slow-motion escape acts in the Devil, to be amazed by the electrifying burst of Post behind the Dernys, to rise to Sercu and Gowland in the B.B.C. sprint and to be confused by the lapping permutations of teams 1, 4, 6 and 11 in the Madisons. Who was this devoted Six Day fanatic? He could have been a clubman, an Earls Court convert or just a layman drawn by the colour, noise and excitement of the fastest indoor sport ever seen in this country. Whoever he was, he no doubt departed into the cool morning air thoroughly entranced by the magic atmosphere of the Six Day. To him the speed, colour and thrills are served up like a star-studded variety show;but what goes into making up this perfect blend of sport and entertainment? If the hour long battles that raged on the Thursday and Saturday nights had continued for, say, two hours, or had been the same every night it is doubtful whether even three home riders would have finished the race. It is a far cry from the broad outdoor tracks used in the Skol Trials to the rush-hour tightness of the Six Track, where positioning and timing are paramount. Whenever the pace became an ordeal it was noticeable how the Englishmen were chasing the bunch off the back instead of off the front, and their madison changes became more ragged. The art of changing is simple. After two laps in the race look for your partner circling above; as he drops down, accelerating, put your left hand in the middle of the bars, ride alongside him as close as possible, grab the pad bulging from his shorts and shove (if there is one). The British boys had the know-how but they invariably slackened their pace when approaching the change compared with the silk-smooth efforts of the continental 'veterans'. The Wednesday evening clash of pedals between Moore and Gowland when changing towards the end of the chase was caused by the Londoner positioning himself too close to his partner in the tight banking. Such a mishap is partly explained by lack of attention through fatigue but also the generally non-Six Day positioning of the Englishmen on their bikes. Post and company seemed to be riding on rails, as if they really were part of a 'blue train, with their straight, rigid arms and piston-like pedalling. The bent-arm sprinters position of Trevor Bull and the bouncing style of a spectacular Tony Gowland contrasted vividly with those rock-steady efforts of the continentals. Probably the most polished pair were the Germans Oldenberg and Kemper who seemed to gain more impetus than anyone from their perfectly executed hand-to-hand changes. Runners-up for the second year they somehow lack the flair in the search for points to match their Madison consistency. Their 1967 conquerors Lykke and Eugen would have probably run them close again had it not been for the early Injury to Freddy Eugen that put his left wrist in plaster. Eugen's changes were consequently not as smooth as usual even though he had the left side of his bars padded to support his wrist during the changes. The requirements of a Sixdayman are many, ranging from the stamina and recovery of a stage race performer to the speed of the track sprinter - and this is reflected in the make-up of his machine. The bars are taped like a roadman's with no slippery plastic tape in sight while the broad saddle is the same as would be used in the Tour de France. Further to ensure comfort riding on rock-hard tubulars over the unyielding ply-wood most riders coated the chamois of their shorts with a thick, antiseptic vegetable grease. The rest of the bike, other than the straight arm position used, is common to most track frames. Very short wheelbase, steep angles and thick tubing in the rear triangle. Normal gear at Wembley was 50 x 16 (84.4'), but no lock rings were used to secure the sprockets. The reason for this was to minimise the chances of injuring legs when crashing. and probably hitting the steeply banked track with the right pedal. 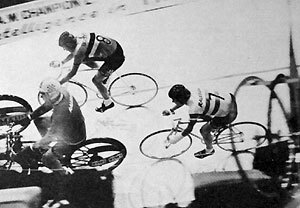 This should not become a common practice, as it means that the fixed wheel cannot be used as a brake, and this was the reason the sprinters could not stand still at Wembley - having to grab hold of the fence, and why they had to use their leather track mitts on their front wheels to slow down. Taking care of all the equipment at Wembley were four continental mechanics who each had a work bench set up behind the riders' cabins at either end of the track. They were amongst the busiest people there, from the time that they could be seen cleaning and polishing bikes at 11.00 in the morning up to the close of the final Madison fifteen hours later. They were always on hand to do quick wheel changes, etc. and when not re-greasing hubs or truing-up wheels they were checking for slow punctures with the aid of a long, narrow tray of water. In fact, tyres were their biggest head-ache with punctures commonplace on the rough texture of the white-painted track, that one wag termed "the smallest concrete track in the world"! As a matt finish was required on the treads to give the greatest adhesion on the 52 degree banking, and because of the puncture tendency, the mechanics were even sticking new treads on tubulars! Almost as hard-working as these gentlemen looking after the bicycles were the soigneurs and boys tending the riders, and their cabins. Their jobs may be routine but there would be no race without them. When the riders leave the track they have to be on the spot immediately. First of all to stop him by grabbing his hand and running him to a halt Eugen had to be caught by his upper arm because of his damaged wrist. Next he has to take the bike and put it on a stand, taking the crash hat with him, then remove the track mitts and be ready with a towel and change of jersey for the sweating rider. On one occasion Verchueren stopped with his runner not in position, and he simply let his bike drop to the ground! When they are not doing this, or preparing their man to go out and race again, the soigneurs have to climb over the bridge with slop buckets and dirty plates to reach the living quarters under the stadium. Then they have to go to the kitchen and fetch more ham sandwiches, chicken legs, spaghetti, rice, fruit or whatever the hungry riders require. A 6-day man probably eats even more than a stage race rider. With something on hand all day - they were even handed drinks up during the racing at Wembley - for their lunch-time breakfast to salame sandwiches and Skol at 2.30 in the morning! When not eating, sleeping or racing the riders most commonly break the routine by acting the fool. At Wembley the most popular clown was bespectacled Piet Van der Lans who had his 28th birthday on the Tuesday - and celebrated it in fine style. The Sidney Lipton band played him "Happy Birthday . . ." and he was presented with an iced cake. Towards midnight he was in very high spirits and leapt on to the roof of his track-side cabin, grabbing the huge Dutch national flag that was placed there. Towards the end of a sprint on the track he was cheering on the riders waving his banner and leaping up and down, when he suddenly disappeared from view as the fibre board roof collapsed I His spirits were not dampened and he was soon besides the banking displaying his cake to everyone high above his head, before cuttng it up and distributing the pieces around the cabins. Later in the week the uninhibited Dutchman brightened up a lull during an afternoon's racing by giving an impromptu solo on the drums, while Horst Oldenberg did his best to accompany him on the saxophone, and Kemper put the castanets up his jersey as if he was a female vocalist. Most of the other humour was preconceived, like Norman Hill's fancy dress routine and the fun with balloons of all shapes and sizes, but one incident was completely unintentional. The hard-working chef Hans Damker had just finished a final night lap of honour, pushed round by the senior riders Post and Pfenninger. As they came to a halt on the 20 degree banking at the finishing line all three lost balance with bikes and bodies falling on top of each other, much to everyone's amusement - particularly to that of Hans Damker! Oldenberg even took off the pacers by giving little, secret signs with his hands; but in the actual racing these signs were in more serious vein, as the pacers control the races to perfection. If Peter Post raced to his limit in the form he had at Wembley there would be little to excite the crowd, but each rider rode for 15 minutes and Sercu usually handed over to the 'master' about a lap down. From that point it was uncanny every night how the pacers could judge Post's speed potential to bring him up with the leaders in the final ten laps. And it speaks volumes for the power of Post how he could challenge on the very top of the bankings his finishing bursts representing a speed of about 44 mph. An amazing performance on such a tiny track. The crowds certainly thought so, and the crescendo of cheering, stamping and applause that greeted him every night will remain the lasting memory of the 1968 Skol Six. The magnificent Post more than lived up to reputation as 'King of the Sixes', superbly combining the qualities of the showman with those of the athlete. It is difficult to see who will emerge as his successor when he eventually retires; although that will not be for about four years I Race Director Charles Ruys engaged four other Dutchmen at Wembley besides Post and the two 20 year olds, Leo Duyndam and Albert Van Midden, seem to have the best chance of making the top, with age on their side. Van Midden was riding his first race as a professional, and with the experience gained on the indoor tracks as an amateur looked like a veteran from the first day - with partner Norman Hill commenting: "They've given me a good one this time." However, Duyndam looks the more likely prospect. A pro. for only a year, he has already won a stage in Paris-Nice and the Tour of Limburg on the road, and taken the Dutch pursuit title. With his Skol team-mate Gerard Koel (the Dutch sprint champion) he soon showed that he also has the flair of a Sixdayman, and the pair ended up with the highest points total - 25 ahead of Post / Sercu - and only two laps down. Their class showed through when they set the fastest double-harness kilometre with 64.4 seconds, and again on the Friday night when they both won their elimination races - and Duyndam out-sprinted his colleague in the 2-up final! Among the four Belgians in the race Patrick Sercu and Theo Verschueren stand out as the most likely to follow in Post's wheelmarks. Ten years younger than his partner, Sercu already has nine 6-day victories to his credit, five of them last season. There are none better at sprinting or in the Madison, and he is quickly becoming adept behind the Derny. He also has the intelligence, temperament and benign personality that has made Post such a hard man to beat. One year older, at 25, Verschueren can already match Post behind the small motors, but he seems to lack the dominating class of a Post and seems more prone to accident. On the Friday at Wembley, with the evening Madison session promising to be the fiercest of the week he hit the safety fence at the top of the home banking when swerving past Sercu and caused the most spectacular crash of the week. He slithered down the whole banking with three riders being brought down and ending up at regular intervals along the straight- with a tyre on each of their bikes exploding with dramatic effect! Besides the Dutch and Belgians, riders from four other continental countries were competing, but with an average age of 30 none of them has established a reputation as big as Post, with only Pfenninger (29 wins) remotely chasing that record tally of 43 victories. Nevertheless Kemper/Oldenberg and Lykke/Eugen are clearly amongst the top teams riding today. That leaves us with the nine English speaking riders; Norman Hill (29) and Aussies Ron Baensch (30) and Bill Lawrie (34) are also experienced on the boards, and are not likely to improve their status by much, while John Aslin and Jim Moore have obvious disadvantages compared with their continental counterparts. They even lack the track experience of Trevor Bull and Tony Gowland, the two home riders most likely to succeed, although both of them at the moment lack the discipline of the 6-day rider. Bull had far more than his share of crashes at Wembley while the freckle-faced Gowland had just as many narrow escapes when he swerved to avoid riders at high speed on the bankings. The busy Londoner wasted too much energy with his, admittedly, thrilling sprints and chases, but he is sure to learn how to pace himself now that he has another Six contract. There is still one rider I have not mentioned-23 year old Graeme Gilmore. In Australia he proved himself the top rider winning the road championship and two Sixes, and at Wembley he displayed the sprinting qualities that also took him to runner-up spot in the sprint championship. He could well become the new Reg Arnold, and perhaps team up with his countryman Bob Panter, who so dominated the appropriately titled Australian Sultanas Grand Prix- the daily prologue to the Skol Six. Yes, Panter/Gilmore could become as famous a combination in the seventies as Strom/Arnold was in the fifties, when they won the last Six at Wembley before this year's successful return. Let us hope that the Skol 6 has come to stay. It is only with this type of spectacular, crowd-pulling racing that the sport can progress as a commercial proposition in this country and arrest the attention of a sceptical public. Organiser Ron Webb and director Charles Ruys can be proud of their efforts for 1968 in providing a programme that pleased both riders and spectators. The only complaints I can pass on are those of crowds on the first four days when there were far too many occasions when there was nobody on the track, and the crowd interest was lost. It was good to see a competent band there five hours every night; perhaps things could be varied by having different groups and acts every night to draw the crowds, as is done at Milan. However, nothing can substitute for the overpowering excitement of that final hour of the Wembley Six. I will never forget the moment when Post and Sercu finally went into the lead. I positioned myself in the very centre of the Skol track, equidistant between the two straights. Not even in a 100,000 strong Soccer crowd have I experienced the same emotion. My very skin was tingling as wave upon wave of thunderous noise rolled down to the track from the packed thousands.